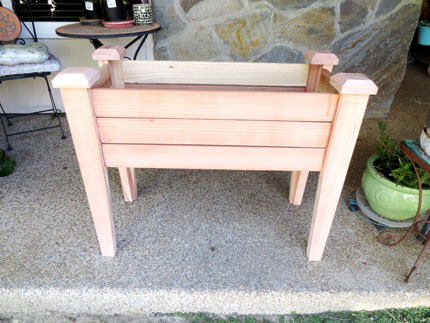 This elevated planter box makes a nice addition to a garden, patio, walkway, or anywhere you want to show off your plants. 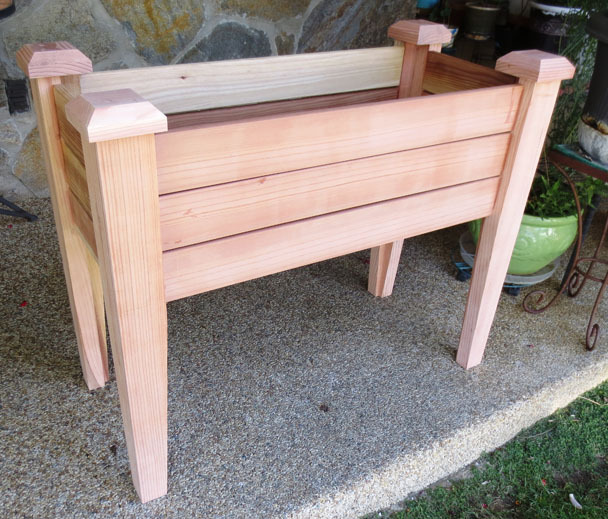 The planter box is approximately 29” high by 36” long by 17” wide at the caps. The inside of the box is approximately 9” deep by 32” long by 13” wide. The entire box, with the exception of the slats that form the bottom of the box, is redwood. 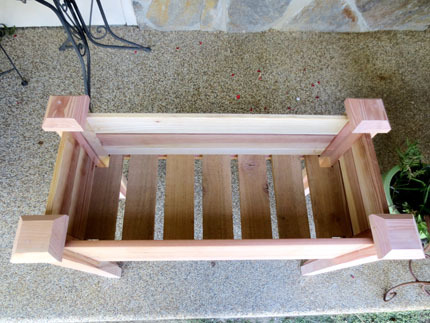 The slats are rough cut cedar. 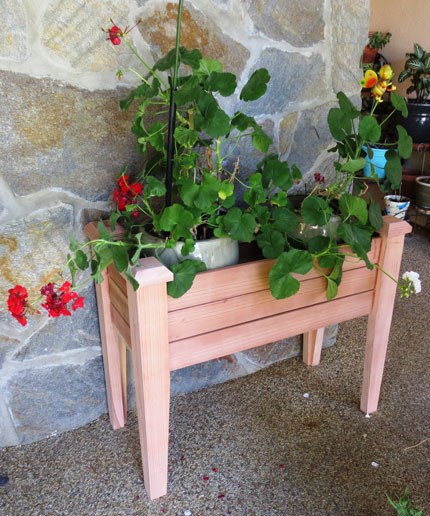 The ZIP file contains all of the pictures, INSTRUCTIONS.PDF file, SketchUp design file "Elevated_Planter_Box_11.skp", and PDF design file "Elevated_Planter_Box_11.pdf". BE SURE TO READ THE "INSTRUCTIONS.PDF" FILE that's included in the ZIP file. The slats are captured in the lower rails. That means that the lower rails supported all of the weight of anything placed inside the box. The stress on the rails caused the lower rails to sag. 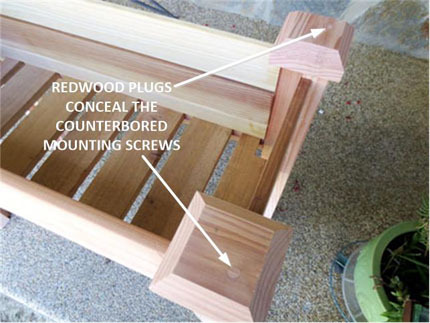 Redwood battens were added to tie the centers of all three side rails together so that all of the rails would support the weight. 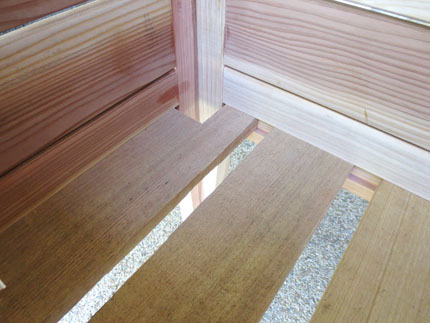 The battens are glued and screwed into position at the center of the side rails. Countersunk screws are used so that the heads of the screws do not project above the surface of the battens. The battens are chamfered on the top and both sides. 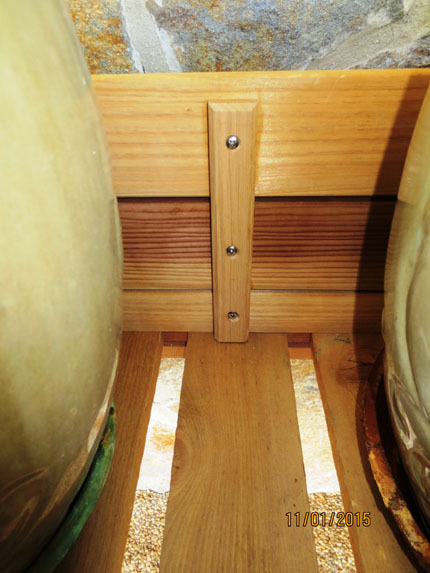 This feature, together with the use of countersunk screws, helps to prevents scratches or other injuries to your hands when reaching inside the box.